Below is a summary of issue #172-174, published in March-August 2017. This issue is available for purchase online by clicking “Add to Cart” below. An electronic PDF of this issue will be emailed to you upon receipt of payment. The 2015 vintage was an outstanding vintage throughout Germany, and extremely good — even exceptional — dry and sweet Rieslings were produced by leading estates. We single out more than 140 dry 2015 Rieslings and more than 160 off dry to very rich 2015 Rieslings (Qualitatswein through Trockenbeerenauslese) to seek out., as well as dozens of other remarkable 2015 Silvaners, Pinot Blancs, Pinot Gris, Scheurebes (from Franconia to Baden), Pinot Noirs, and Lembergers that we strongly recommend. This AVA is the source of some of the world’s best sparkling wines, Chardonnays, Pinot Noirs, and Zinfandels. We highlight some of its key features, and note the project seeking to identify taste characteristics in RRV sub-districts through medium of varietal Pinot Noir. We review more than 70 wines from the Russian River Valley, more than half of them Pinot Noirs from the fine 2014 and 2015 vintages. The restaurant business is not getting any easier. Margins are thin. Costs are rising. The labor pool is tight. Competition is ferocious. Disposable income for many Americans is shrinking. A recession is in the wings. Customer counts are erratic — if not in decline. Maybe it is time to brush up your wine service — especially these four potentially customer alienating problem areas. A vast array of wines this issue, from California and Washington on the home front, as well as top values and new discoveries from Argentina, Australia, Austria, Chile, France; Germany, Italy, New Zealand, Portugal, and South Africa. Almost 900 wines altogether are recommended, out of nearly twice that many tasted for these issues. From the USA, we present excellent sparkling wines; outstanding Chardonnays and Sauvignon Blancs from 2014 and 2015; fine Cabernet Sauvignons, Cabernet Francs, and Merlots (and blends) from the 2013 and 2014 vintages, from California and Washington state (Amici, DeLille, Joseph Phelps, Robert Mondavi, Screaming Eagle, St. Supery, Trefethen, and so on); and stunning California Pinot Noirs, with an emphasis on those from Sonoma County, and specifically from the Russian River Valley. 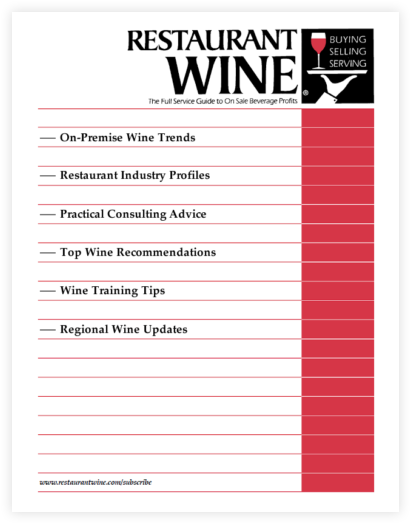 Never miss an issue of Restaurant Wine. Get 144+ pages/year (equal to 6 issues) in PDF format with instant delivery by email. 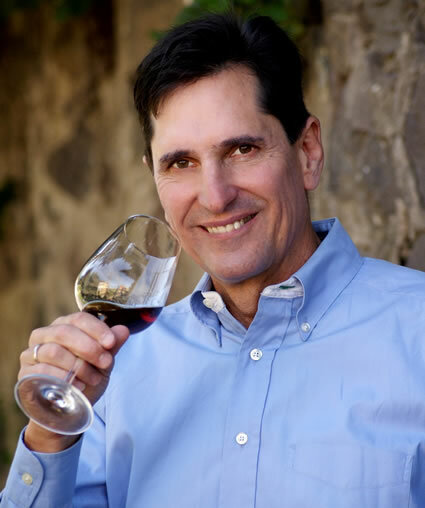 Restaurant Wine is published by Ronn Wiegand, one of only four people in the world to hold the titles of Master of Wine and Master Sommelier. All contents © 2019, Ronn Wiegand. All rights reserved.